Hi everyone. There's a new theme over at Art Journal Journey. Its Back to School, hosted by Elizabeth of Bleubeard and Elizabeth. I think its a really fun theme, and today I have a journal page all about back to school for you. So my take on this theme is from the perspective of a teacher. Last week I started my 33rd year of being a high school biology teacher, so back to school for me meant meeting my new students. I have 67 students in 3 classes right now, mostly sophomores in high school. So I made some paper dolls using Stampotique's Daniel Torrente stamps. I dressed them up in their new back to school clothes, and then mounted them on my prepared background in my journal. I think these kids definitely look like high school kids, and although I have mostly girls on my page (mainly because those are stamps I own), I actually have a few more boys than girls in my classes. I am also linking up to Try It On Tuesday where they also have the theme of children. I am loving the fact though that this is the Labor Day holiday weekend and I don't have to go to work this Monday morning. Its a nice way to ease into the new school year. Hope everyone else is having great start to the new week. I think it's wonderful that you have created your page from that of a teacher. It makes it unique, and it is also very American, since Labor Day and Labour Day are only celebrated in No America. These students have definitely put on their best clothes to meet their new classmates. Thanks, too, for explaining about the cows. I was SO glad we had similar concerns. It's amazing how much alike we think on so many things. BTW, I want to use your sewing machine. Mine does NONE of those fancy adorable stitches. I think every teenie generation is this...lol! We were for sure strange as well at those times...hihi!! I knew that theme would be your theme! Thank you for joining us again dear Erika! Happy new week ahead and enjoy your free Monday! An I forgot to mention how super the new header is! Love it! Love those girls you have in your class, each one looks quite a gal. Its a fabulous page and great background. Enjoy your Monday at home. Learning lots of different things from this challenge - although I had look up 'Sophomore'. Oooh they are all characters of different types Some are adorable som fun but all very excited looking. Well done! Thank you for joining TIOT Erika! but you know I have a teenie monster in reality here..that's enough I guess...HIHI!! Hope your first school day after the long weekend went well! Thanks bunches for sharing your brilliant page with us at TIOT! Great take on our theme ,,children". 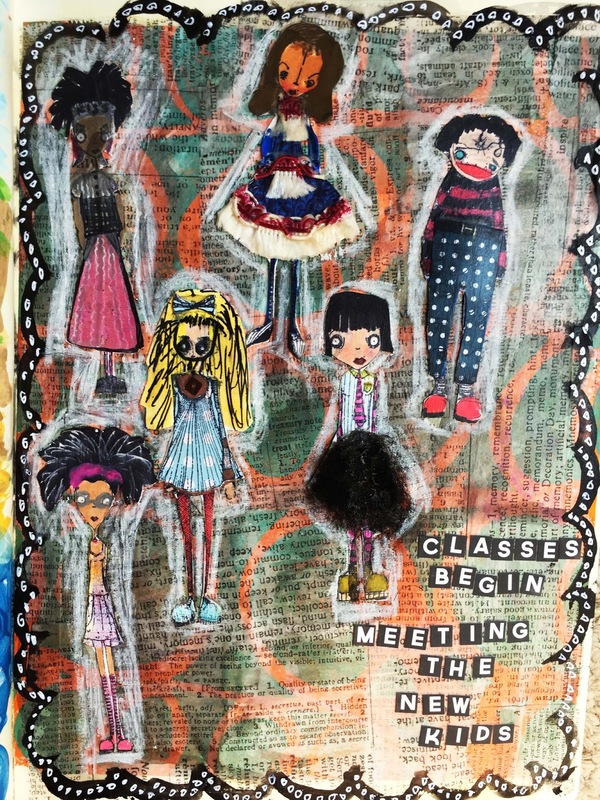 How fun seeing your teacher's perspective in your dolls! Very clever idea and well done for the challenge! A fabulous page Erika, love the 'kids' so cool.